The reality is people in your church are hurting. Marriages are struggling. Emotions are raw. Trauma is real. Depression is unrelenting. Anxiety is high. Addictions are prevalent. Shame is thick. Identities are confused. Transitions are hard. Families are arguing. Such is ministry in a broken world. Another reality is that people in your church are hurting alone. It’s intimidating to ask for help. So most people wait until things are “that bad” before they reach out. What’s the problem with that? Well, by the time things get “that bad,” they’re that bad! A crisis that would have been more manageable at an early stage has festered into something much more complex and tedious. What can we, as pastors and churches, do about it? We can raise awareness of excellent counseling resources through channels that people can initially explore with privacy and anonymity. This is one of the redemptive benefits of social media. People will read a blog or listen to a podcast (if they know it exists) before they will call a pastor. If the resource is helpful, they will be more likely to follow up with the person who posted it (that’s you and it’s before things got “that bad”). 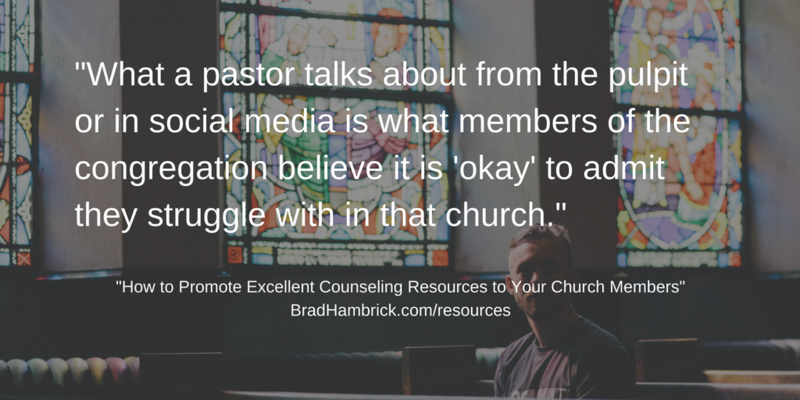 Recommendation: Pastors, churches, and ministries should use their Twitter and Facebook profiles to promote quality Christian counseling resources on the assortment of life challenges members in their church and community face. Resource List: Here is a list of suggested resources from bradhambrick.com to get you started. Using the process below, it is recommended that you add to this list of resources. You will need to copy-paste the material from this document onto a file you can personalize on your computer. Here is a folder of counseling memes (more memes will be added) from bradhambrick.com resources. Rationale & Process: It is beyond the scope of this post to provide a definitive list of resources that would best serve or represent every church and community. The document above gets you started and the process below can help you easily build a more robust list and easy-to-use method of posting over time. You need to have an intentional approach to social media. For me, I set aside 15 minutes on Monday morning to schedule posts for the week. Once you’ve got the document of resources created, it doesn’t take long. Have a database of quality posts or memes to promote which is easy to update (that’s the Google Doc above). For me, that’s an Evernote file. I schedule two posts per day. Once I post a week’s worth of material, I cut-paste the tweets I scheduled to the bottom of the page so that next week I have fresh material at the top of my Evernote file. I write each entry just the way I want to post it, so scheduling is an efficient copy-paste process. Tip: Change the settings on your Twitter account to automatically post what you tweet to your personal and/or church’s Facebook account to increase the awareness created by each tweet. Update your database as you find good material. Ministry will force you to find resources. Multiply the impact of serving one person by adding the resources you find to the posts your will regularly promote. The longer you practice this discipline, the more your resource list will reflect the needs of your church and community. Side Note: If there are other events or ministries in your church that need more consistent promotion, include them in your list of tweets to promote as well. End Goal: What are the big “wins” of this exercise? I believe there are two that merit making this scheduling practice a weekly exercise. People who are hurting in your church become aware of quality resources earlier in their struggle. Everyone in your church is learning of quality Christian resources that help them apply their faith to life.